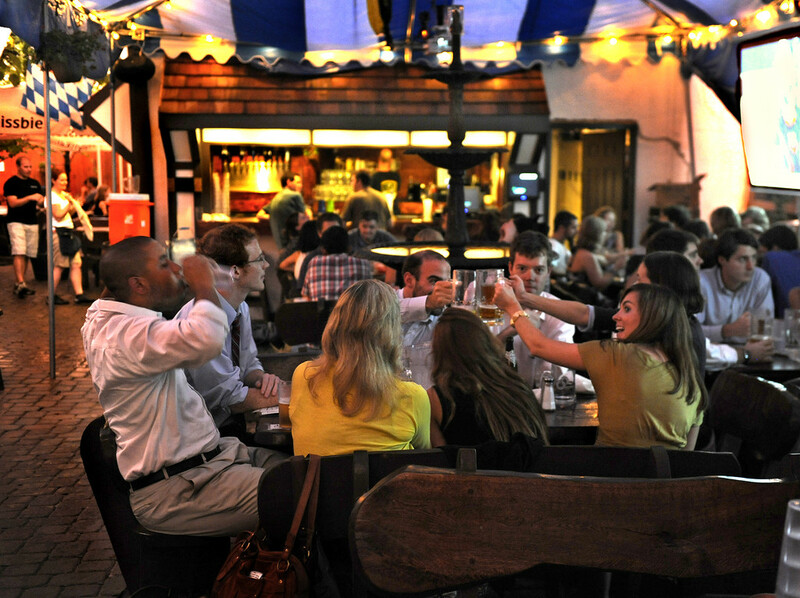 Saturday night we went out with another couple to Biergarten Haus on H Street in DC. We initially went to H Street to go to another restaurant that ended up having a wait of an hour and a half. 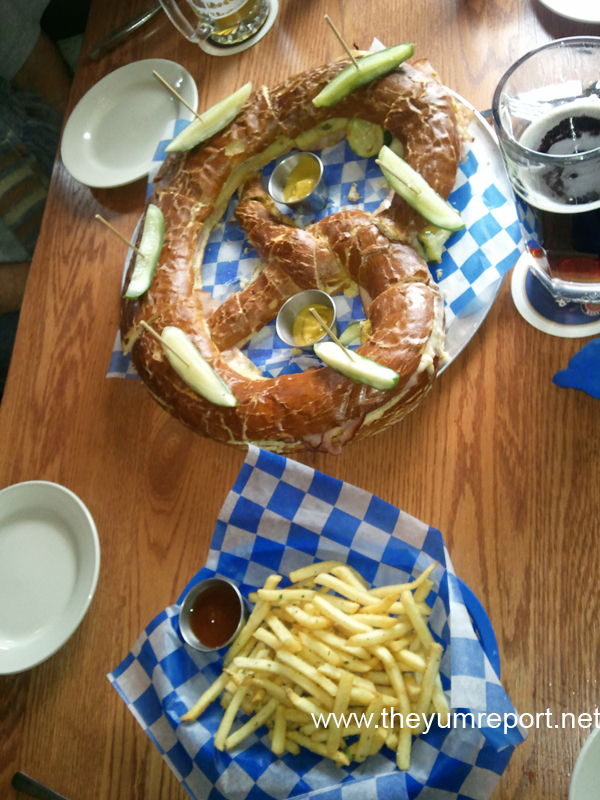 Even though Biergarten Haus had a wait of an hour, we decided it was worth it. Before we were called (they actually take down your number and call twice before giving up your spot in line) we decided to grab a pre-dinner drink and play some skee-ball at H Street Country Club just a few blocks down. 3 games of skee-ball and 45 minutes later we decided we were ready to eat and even though we hadn’t been called yet, we checked on our place in line at the Biergarten. Lucky for us, a seat was about to open and we only had to wait another 5 minutes before being let in. At first they sat us at a barrel with 4 stools. It was close quarters and we weren’t going to have anywhere to put our food. We ordered our drinks and then spotted a table across the way that appeared to be empty. The waitress said we could move tables but warned us that some randoms could come sit down at any time since they seat as many as they can. We didn’t mind. Sure enough, 5 minutes after we sat down, two older men sat down next to us. At first we all thought it was going to be awkward, but it wasn’t bad. It was so loud in the place that you could really only hear the person directly in front of you. We kept to ourselves and they kept to theirs and all was well. For dinner we ordered a few things. Noah and the other couple split a giant pretzel with ham and cheese (Laugenbrezel share and share alike) and I had pretzel bites (Laugenbrezel) and potato pancakes (Kartoffelpuffer). The verdict on the giant pretzel was that it was a little too salty and there was not enough meat and cheese in proportion to the pretzel. The french fries that were served with it were garlic fries and were delicious and cooked to perfection. 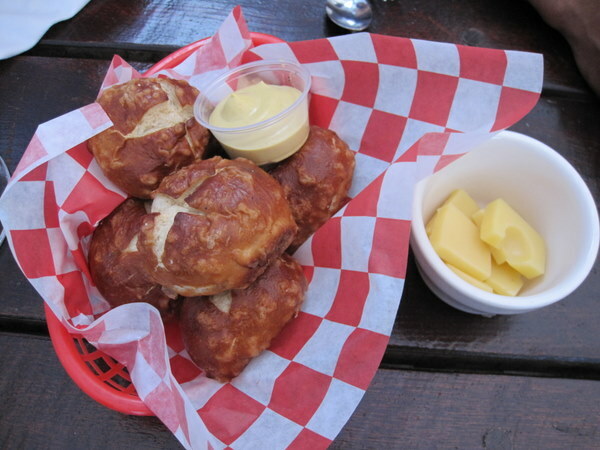 My pretzel bites were good at first (with cheese and horseradish mustard) but then after the second one the salt really started to kick in – and it was overwhelming! Luckily, the beer I had – the Weihenstephaner Hefeweizen – had a sweet, peach flavor that helped to minimize the saltiness. The potato pancakes were a little too thick but were still tasty. I only ate two of them. Overall – the experience was fun, the drinks were really good and the food was okay. Worth the price? Probably not. But it seemed to be as much about the atmosphere as it was about the fare. And we did have a really good time so I’d probably do it again if we had the chance. But maybe I would just go for the beer next time instead of the food! I feel like you were being nice to this place, the food was ugggggg. I felt like the salt content was the express highway to Coronary city!!!!!!!!!!! I’ve heard such wonderful things about this place.. you’ve convinced me to go! And that pretzel, with all the pickles?? I’m dying.. looks delish! I’ve never eaten there because the food looks HUGE, but we like to go get drinks since the beers are large for a good price. Now I know, beer is the thing there and not the food. I am writing a book called “So…How Did You Meet Anyway?” It is a collection of people’s “how we met” stories.